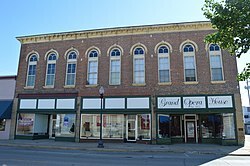 The Beardstown Grand Opera House, a site on the National Register of Historic Places. Location of Beardstown in Cass County, Illinois. 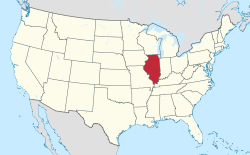 Beardstown is located at 40°0′44″N 90°25′43″W﻿ / ﻿40.01222°N 90.42861°W﻿ / 40.01222; -90.42861 (40.012189, -90.428711) on the Illinois River. According to the 2010 census, Beardstown has a total area of 3.627 square miles (9.39 km2), of which 3.57 square miles (9.25 km2) (or 98.43%) is land and 0.057 square miles (0.15 km2) (or 1.57%) is water. A large pork slaughterhouse, formerly owned by Kraft and Cargill now by JBS, is a major employer and has attracted a substantial immigrant population to Beardstown in recent years. As of the census of 2000, there were 5,766 people, 2,172 households, and 1,437 families residing in the city. The population density was 1,692.1 people per square mile (652.9/km²). There were 2,339 housing units at an average density of 686.4 per square mile (264.8/km²). The racial makeup of the city was 90.76% White, 0.87% African American, 0.23% Native American, 0.33% Asian, 0.05% Pacific Islander, 7.01% from other races, and 0.76% from two or more races. Hispanic or Latino of any race were 17.90% of the population. There were 2,172 households out of which 32.5% had children under the age of 18 living with them, 49.1% were married couples living together, 11.8% had a female householder with no husband present, and 33.8% were non-families. 28.2% of all households were made up of individuals and 14.4% had someone living alone who was 65 years of age or older. The average household size was 2.59 and the average family size was 3.11. In the city, the population was spread out with 26.1% under the age of 18, 9.8% from 18 to 24, 29.2% from 25 to 44, 19.4% from 45 to 64, and 15.5% who were 65 years of age or older. The median age was 34 years. For every 100 females, there were 99.0 males. For every 100 females age 18 and over, there were 95.3 males. The median income for a household in the city was $29,104, and the median income for a family was $31,951. Males had a median income of $25,481 versus $20,054 for females. The per capita income for the city was $13,777. About 17.0% of families and 19.8% of the population were below the poverty line, including 24.7% of those under age 18 and 8.1% of those age 65 or over. Beardstown was first settled by Thomas Beard in 1819; he erected a log cabin at the edge of the Illinois River, from which he traded with the local Native Americans and ran a ferry. The town was laid out in 1827 and was incorporated as a city in 1896. During the Black Hawk War in 1832, it was a base of supplies for the Illinois troops. Thomas Beard's son, Edward "Red" Beard, a noted gambler and saloon keeper of the Old West, was killed in a gunfight in Kansas in 1873 by "Rowdy Joe" Lowe. Earlier, he had built a two-story brick building which was used for 85 years as a store and inn. This inn is alleged to have sheltered Abraham Lincoln on his visits to Beardstown, but that is legend and unconfirmed. The building was demolished and replaced by a post office. William Henry Herndon, Lincoln's Springfield law partner, claimed that Lincoln contracted syphilis from a prostitute in Beardstown, an incident author Gore Vidal colorfully recounts in his historical novel Lincoln (1984). The Beardstown Courthouse was the site of a famous trial which helped build Abraham Lincoln's reputation as a lawyer after he used a copy of a farmer's almanac to undermine the credibility of the prosecution's key witness. The scene was later depicted in a painting by Norman Rockwell. A Lincoln Museum is on the second floor of the courthouse along with many Native American relics. From 1984 to 1993, a group of 16 late-aged women were picking stocks in the Dow Jones and over the course of nine years were claiming returns of 23.4% on their stocks. Once they went public with the amazing returns, they gained national recognition for their success. The Beardstown Ladies, with an average age of 70 (1994), were asked to appear on The Donahue Show, CBS's Morning Show, NBC's The Today Show, and ABC's Good Morning America. For six straight years they were honored by the National Association of Investors Corp's "All-Star Investment Clubs". In 1993, they produced their first home video for investors called, The Beardstown Ladies: Cooking Up Profits on Wall Street. By 1994, they wrote their first book, The Beardstown Ladies' Common-Sense Investment Guide, which sold over 800,000 copies by 1998 and was a New York Times Best Seller. The Beardstown Ladies become a global phenomenon and TV stations from Germany, Brazil, and Japan were interviewing them and taping their monthly meetings in Beardstown. The seeds of scandal were planted in late 1998: a Chicago magazine noticed that the group's returns included the fees the women paid every month. Without them, the returns dwindled to just 9%, underperforming the Dow. An article in the Wall Street Journal led the ladies to hire an outside auditor, which proved they had indeed misstated their returns. Time magazine jokingly stated that they should be jailed for fraud and misrepresentation. As of 2006[update], the Beardstown Ladies were still buying stocks. Their books can be bought from Amazon.com for mere pennies. William "Duff" Armstrong, accused murderer, was tried in Beardstown and successfully defended by Abraham Lincoln. Walter Flanigan, co-founder of National Football League, born in Beardstown. Red Norvo, jazz vibraphone pioneer, born in Beardstown. Janice O'Hara, All-American Girls Professional Baseball League player, born in Beardstown. Jesse Wallace, United States Navy Captain and the 27th unique Governor of American Samoa, born in Beardstown. Chisholm, Hugh, ed. (1911). "Beardstown" . Encyclopædia Britannica. 3 (11th ed.). Cambridge University Press. p. 578. ^ Taylor, Richard S. (Summer 2000). "Telling Lincoln's Story". Journal of the Abraham Lincoln Association. University of Illinois Press. 21 (2): 60. ISSN 0898-4212. Archived from the original on 2011-06-04. Retrieved 2010-04-21. — citing Wilson, Douglas L. (1998). Honor's Voice: The Transformation of Abraham Lincoln. New York City: Alfred A. Knopf. pp. 127–29, 140. ISBN 978-0-375-70396-6. ^ Gongloff, Mark (2006-05-01). "Where Are They Now: The Beardstown Ladies". Wall Street Journal. Retrieved 2007-09-09. ^ For example, The Beardstown Ladies' Common-Sense Investment Guide. ^ Sorensen, Stan; Joseph Theroux (2007). "The Samoan Historical Calendar 1606-2007" (PDF). Government of American Samoa. p. 180. Archived from the original (PDF) on 27 May 2010. Retrieved 21 April 2010. Wisniewski, Mary; Stebbins, Christine (Jun 20, 2012). "Midwest farm town, transformed by immigration, thrives". Reuters. Wikisource has the text of the 1911 Encyclopædia Britannica article Beardstown.